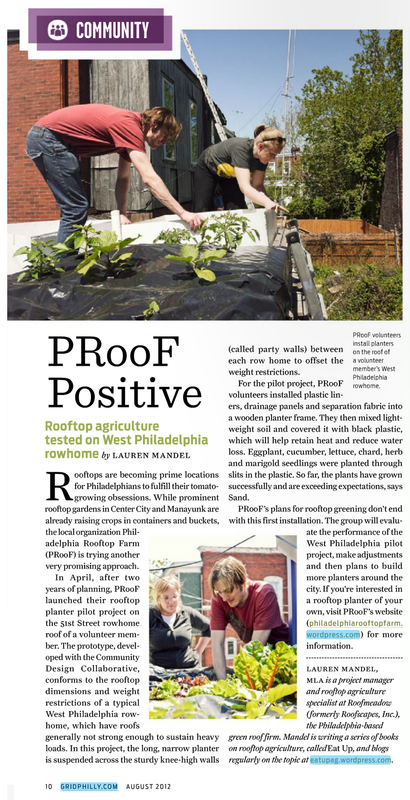 Lauren Mandel, project manager and rooftop agricultural specialist at Roofmeadow, wrote a wonderful piece on PRooF for this month’s issue of GRID Magazine. The article touches a bit on the 51st St. pilot project, and the planter prototypes developed with the Community Design Collaborative. It also mentions our plans to move forward in developing and tailoring these test planters to even more Philadelphia row homes. This phase has already begun! Aside from being held up indoors during the 100 degree weather for the past few weekends, we’re back at it, constructing new ways of reinforcing and moving the planters from roof to roof. We’re also strategizing ways to collaborate with other rooftop farming initiatives, like Cloud 9 Rooftop Farm, to do more prolonged testing and prototyping. Stay tuned for information on Volunteer Days, as well as a Fundraiser Event we hope to have later this summer! Some of you may already know, but for those of you who don’t, Jay Sand, founder of PRooFhas an amazing rooftop veggie garden at his own home. Check out Lauren Mandel’s latest blog post over at EAT UP blog on his garden, and stay tuned for Lauren’s new book on rooftop agriculture! Check out this amazing planting plan designed by PROOF volunteer Karena Thurston. This plan is designed for our prototype planter located on 51st street. It’s organized according to height with shortest plants at the south edge and tallest plants at the north edge, and also includes marigolds to attract pollinators. Last weekend PROOF volunteers got about half of the plantings done, and we will be finishing up mixing the soil blend and planting out the beds this Sunday – send me an email at alice@philadelphiarooftopfarm.org if you are interested in helping out! This coming week one of our delightful members, Nissa Eisenberg, will be making a Pecha Kucha presentation on Philadelphia Rooftop Farm and rooftop farming in general. Pecha Kucha is a presentation style that consists of multiple speakers showing a set number of slides for a short period of time, keeping the presentations concise and fast-paced. It should be really fun! Tactical Urbanism Salon on April 28, from 1-6pm at the Storefront for Urban Innovation (2816 West Girard Avenue, Philadelphia, PA). The event is being held by National American City, a national urban planning magazine. Space is filling up fast, so please RSVP at: http://tacticalurbanismphilly.eventbrite.com/ . Thanks! Greetings from the Philadelphia Rooftop Farm! We hope things are going well for you, your family and your community. We know PROOF may not have been in touch for a while, but after a bit of hibernation we want to reach out again, say hi and let you know we’re getting ready to accomplish some good things in 2012. SUNDAY, APRIL 15, 6pm, PROOF MONTHLY MEETING–50th St. and Baltimore Ave. So, come on Sunday the 15th to meet the planter, and maybe plant it a bit yourself, then be ready for a meeting that will inspire you to share your talents with PROOF and become part of the organization as we start to accomplish great things. See you there! A nice update to let everyone know PROOF has hired the wonderful Alice Edgerton to work with us throughout the growing season, helping organize this merry band of urban farmers (like herding cats…) into a unified farming force. Welcome Alice! The Philadelphia Rooftop Farm is hiring! PROOF, a nascent rooftop farming organization that has great ambitions to transform roofs all over Philadelphia into viable organic farmland, is looking for a responsible, enthusiastic and generally amazing part-time organizer who will work with the PROOF collective throughout the 2012 growing season to help with our upcoming citywide pilot program. The Philadelphia Rooftop Farm (PROOF, http://www.PhiladelphiaRooftopFarm.org), is a blossoming project that intends to transform Philadelphia’s many flat, under-used rooftops into viable community-supported organic farmland. PROOF’s organizing group, composed of volunteers from around Philadelphia with expertise in farming, building, roofing, architecture, community organizing, etc., has been working for two growing seasons to develop and test viable designs for high yield, highly-efficient self-irrigating planters. PROOF is looking for a part-time organizer to work with the collective throughout the 2012 growing season to help us take the organization to the next level–from the planning, thinking and “forming” stages to the “we’re farming crops on a whole lot of roofs all over Philadelphia and it’s awesome!” stage. This is a paid position funded through PROOF’s fundraising efforts. — archive PROOF’s working documents and help to draft a “citizen’s manual” to share our knowledge online and on paper. — seek and apply for grants or work with PROOF on other fund raising, if desired, to extend the position. If you’re interested please e-mail an introduction BY FEBRUARY 15th to “jay@fundamentalchange.net”. Serious inquiries only.